When we have vision problems, we should really take advantage of every tool available to preserve and enhance our sight. One great way to protect our vision into old age is by ensuring that we have all of the vitamins and minerals that our bodies need to maintain great eye health. PreserVision Original Soft Gels are just such a supplement. A perfect complement to a healthy diet, these pills can help prevent age-related macular degeneration, via a cleverly mixed range of vital nutrients. • PreserVision Original Soft Gels contain substances which scientific studies have discovered are vital for good eye health. These include Vitamins A and E, beta carotene and minerals such as Zinc or Copper. These pills fill in the gaps where a good diet can still miss out on essential nutrients. 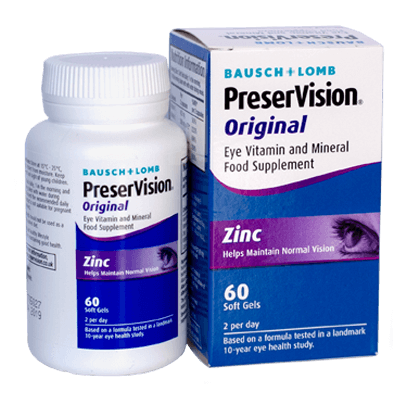 • Produced by eye experts Bausch and Lomb, PreserVision Original Soft Gels are guaranteed to help prevent the devastating consequences of age-related macular degeneration. • The manufacturers recommend taking two pills each day - one with your breakfast and one with your evening meal. The gels come in a pot which contains 60 pills, so it will last around one month. We take supplements for strength, digestion and our hearts, so why not for our eyes as well? PreserVision Original Soft Gels are the most effective eye supplement available, and are particularly effective for those aged between 40 and 60.